I apologize if this post seems a little stale in terms of the news cycle, but I’ve been pondering it for about a month and now that my blog is back up and running, it’s time to discuss the performance aspect of Colin Kaepernick’s Know Your Rights Camps. I realize that, at first, that sounds somewhat negative, as though I am calling Kaepernick’s day long seminar for youngsters of color a mere performance–and that is not what I mean. If nothing else, Kaepernick is proving to be extremely earnest in his charity and educational work. What I mean is that I want to take a closer look at the the theatrical components of these camps, what it tells me about his project, and and how performance is used to instruct kids–particularly Black kids–about how they interact with the world. The First Defense Legal Aid performed skits to show not only how to resist any police coercion but also how to articulate their rights to minimize conflict. 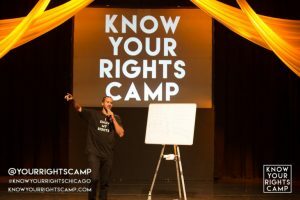 The Know Your Rights camps appear to take a multifaceted approach to teaching kids about what rights they have, how they should invoke them, and how to include other things like nutrition and racial consciousness into their lives. Thus, the attendees had already heard about their 10 Rights from speakers and posters and the t-shirts handed out to them. But in order to instruct the attendees in how to invoke their rights when stopped by law enforcement, the free legal aid group performed skits. This embodiment of the instruction (as opposed to a non-embodied form, like written instructions) can be a helpful tool for remembering information, but it also allows the attendees to see how a real life situation could play out. I thought this was interesting–that an event as serious and earnest as the Know Your Rights camp would embrace a performative pedagogy. As a professional athlete, Kaepernick is already a performer of sorts, and thus I would not have expected his program to present the Know Your Rights material in a performance, in case it might appear that this Know Your Rights program wasn’t a serious endeavor. On the contrary, the program is quite serious and the skits–of which there is yet to be video or other media recording–bring that home for the attendees. It affords the kids a chance to see how they, too, can be smart and strong in the face of police intimidation, which can increase their confidence. And knowing is half the battle, according to some cartoon mercenaries I heard one time. This entry was posted in Politics, Sports and tagged Colin Kaepernick, Football, Know Your Rights, performance. Bookmark the permalink.